Not only did we launch a new fund, invest in five farms, and double the size of our team… we also conserved and put conservation in motion on more farmland than in any prior year. Thank you to our community of farmers and partners who share in the mission to support viable, sustainable working farms. It’s our pleasure to share these highlights from the last year. In Pittstown, New Jersey, we sold a conservation easement on an 88-acre vegetable and fruit farm we acquired with Jersey Farms Produce in 2014. The easement was purchased by Hunterdon County and funded in part by the State’s Agricultural Development Committee. The easement will contribute to an affordable purchase price for the farmer, Hector Perez, at the end of the lease term. In Skowhegan, Maine, we sold an easement on a 298-acre property we acquired with Santy Dairy Farm in 2018. The easement was sold to Maine Farmland Trust, which also conserved Brad Santy’s 208-acre adjacent home farm in 2018. These conserved farms are part of a 1,253-acre puzzle of conserved farmland in Skowhegan that Maine Farmland Trust has been working to protect since 2002. In Great Barrington, Massachusetts, we financed North Plain Farm’s purchase of 82 acres of farmland, in partnership with Berkshire Agricultural Ventures. The property is located on a planned trail network, has frontage along the Housatonic River and is located one mile north of Main Street. Preserving this farm is a priority for the community, and the project has been selected for consideration this year by the state's Agricultural Preservation Restriction Program. In East Fishkill, New York, we participated in the purchase and conservation of a 350-acre parcel of farmland, woodlands and wetlands. The transaction was led by the Scenic Hudson Land Trust, with participation from the Dutchess Land Conservancy and Hudson Highlands Land Trust. 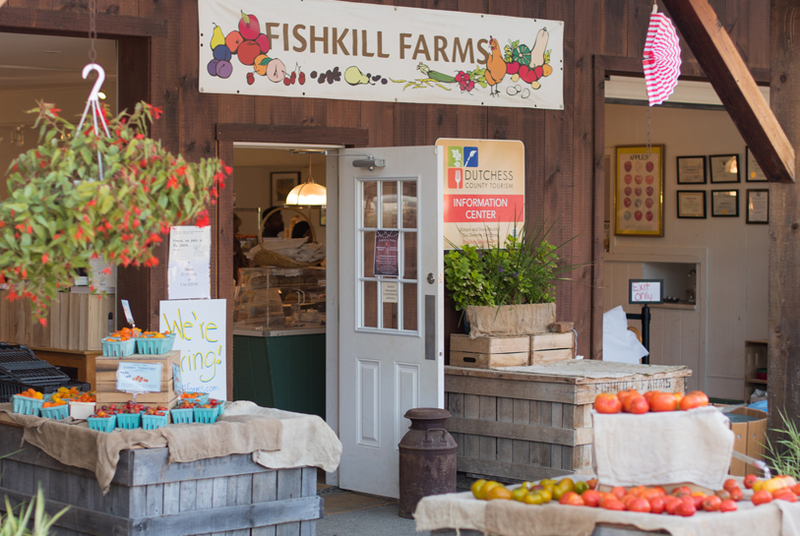 The property is adjacent to Fishkill Farms, which will expand their enterprise by putting 105 acres of fallow agricultural soils back into production. In South Burlington, Vermont, we partnered with the Vermont Land Trust to purchase 375 acres on the edge of urban development, in a complicated estate sale. The property is a top conservation priority for the City of South Burlington, which also contributed significant funding at closing for an Option to purchase a conservation easement within five years. After several decades of conventional row crop tillage, the land will be converted to perennial pasture by Bread & Butter Farm for their pastured livestock enterprise. This change in use will positively impact soil health, water quality, and biodiversity. Dirt Capital closed on five new projects this year, investing $4.4 million in 689 acres of land and farm buildings. 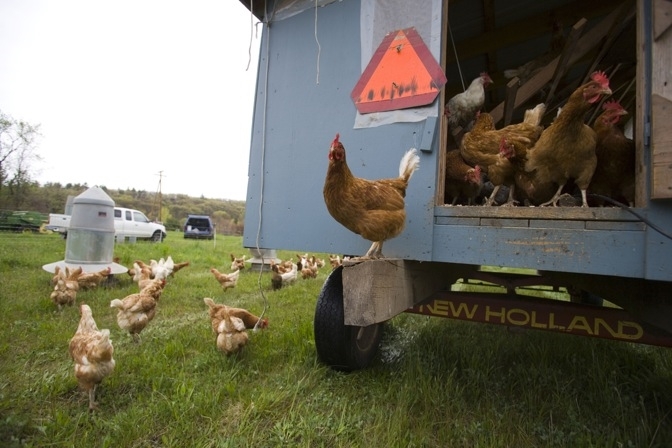 These projects include partnerships with several terrific farmers and land trusts to conserve and regenerate agricultural properties across New York and New England. These five new projects bring our total to twenty farm investments in five years. Profiles of several of these projects can be found here. Dirt Capital Partners 2018 held its first close in July 2018. The fund presently has 20 investors and has invested in three projects to date. We are still accepting new investors (accredited investors only), and anticipate a final close in July 2019. Please contact Jacob at jacob@dirtpartners.com for more information. In February, Jason Kenny joined as our Finance Director to manage the company’s financial affairs as we grow in scale and complexity. Previously, Jason was CFO for seven years at two fixed income and currency investment management funds in New York City. Jason grew up in Poughkeepsie, NY, graduated from Marist College and is a CPA. He lives in Philmont, NY with his wife and son and serves as the Treasurer of the Philmont Library. In September, Rebecca (Becky) Ferry joined our Farmer Services team to coordinate activities in the New York area. Prior to joining Dirt Capital Partners, Becky spent eleven years as a Loan Officer at Farm Service Agency. Becky holds a Bachelor’s degree in Animal Science with a concentration in Finance from Cornell University. She and her sister own an 80-cow Jersey working dairy farm in Johnstown, NY, and she currently serves as Vice President of the New York State Jersey Cattle Club. Julia Jones, a Master’s student in Environmental Economics at the University of New Hampshire, joined Dirt Capital as a Summer Associate and has continued to work part-time while completing her Master’s. Julia has a background in vegetable farming, farm business management and lending. She was formerly a Business Manager at the Kitchen Garden Farm in Sunderland, MA and Assistant Branch Manager at M&T Bank. Julia is working with Benneth and Becky on measuring Dirt Capital’s farmer partner operational performance with available industry benchmarks. In October, we moved our office to downtown Chatham, NY. If you are in the area, please stop by and say hello. Jacob and Benneth presented to the Financial Services and Consulting staff of Farm Credit East about Dirt Capital and impact investing in agriculture, at the Farm Credit East headquarters in Enfield, CT in July 2018. Benneth presented “Innovative Models for Land Access”, on a panel with Vermont Land Trust, Land for Good and Iroquois Valley Farms discussing creative mechanisms to solve challenges in farm conservation, access, expansion and succession, at the 37th Annual NOFA-VT Winter Conference in Burlington, VT.
Jacob participated in the 6th Conservation Finance Practitioner Roundtable held in April in Minneapolis. The roundtable was largely focused on financing for conservation practices in mainstream agriculture, with representatives from several large agribusinesses include General Mills and Danone. A key outcome of the session recognized the critical importance of professional intermediaries to support conservation finance transactions in agriculture. Benneth attended the Vermont Grazing and Livestock Conference, the Vermont Grass Farmers Association Annual Meeting, and the Ranching for Profit one-day workshop, in Fairlee, VT, Richmond, VT and Northfield, VT respectively, and entered year two of her three year board term with the Vermont Grass Farmers Association, where she serves as the Treasurer. Jacob presented a workshop at the annual conference of the Pennsylvania Association for Sustainable Agriculture (PASA) titled “Financing for Farmland Access, Expansion, & Transition with Dirt Capital” in February 2018. Jacob and Becky presented a brief summary of Dirt Capital’s approach to partnering with farmers at the Maple Hill Creamery Annual Meeting in October 2018. Maple Hill Creamery was started in New York’s Hudson Valley and is a 100% grassfed organic dairy company that sources entirely from small dairy farms in New York State. Benneth attended the 4th annual Maine Farmland Access Conference organized by Land for Good and Maine Farmland Trust, where she participated in the Service Provider track, an interactive workshop track focused on providing services to farmers in process on a generational farm transfer. Jacob participated in a Soil Health Webinar hosted by Boundless Impact Investing in May, 2018. He was joined by two other innovators in the field: Paul McMahon from SLM Partners and Russ Conser from Standard Soil. Jacob also contributed to a follow-up report titled Sustainable Finance from Farm to Fork: Impact Investing in Farmland. Benneth presented some of Dirt Capital’s projects in New York State to the New York Certified Organic meeting in Geneva, NY with Dirt Capital farmer partner and Organic Valley pool coordinator Anne Phillips of Triple Three Livestock in Marathon, NY. Dirt Capital Summer Associate Julia Jones attended the Food Finance Training in Philadelphia, and the National Farm and Ranch Business Management Education Association Conference in Harrisburg, PA, and participated in the 2018 Northeast Sustainable Agriculture Working Group: It Takes a Region Conference, held in Philadelphia, PA.
Jacob joined the Investment Committee for the Foundation for Agricultural Integrity, providing guidance to the Foundation’s Board of Trustee as it seeks to align endowment investments with the Foundation’s mission and values. Becky participated in the annual meeting of the New York Farm Viability Institute in Albany in November 2018. Benneth and Becky attended the Annual Customer Appreciation dinners of Farm Credit East, in West Springfield, MA and Schodack, NY, respectively. Becky and Jacob attended a celebration of four years of the Hudson Valley Farmlink Network as well as the launch of Farmland for a New Generation New York, in Saratoga Springs, NY. Coordinated by American Farmland Trust, the program will support a network of Regional Navigators, or partner organizations, that will provide training and customized support for farmers and landowners in regions across New York. 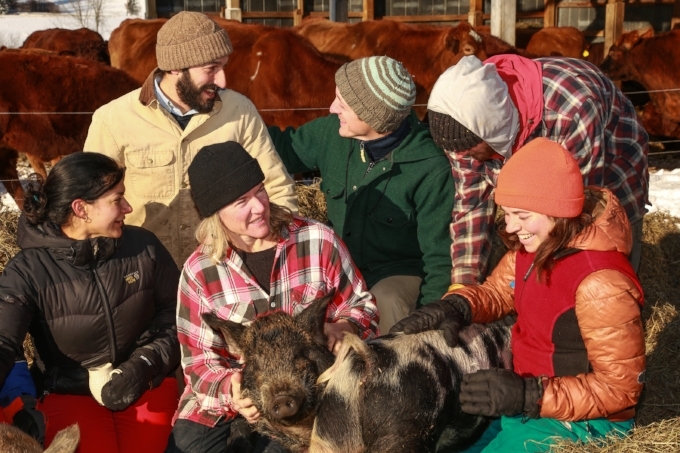 Jacob taught a month-long course in January 2018 on Local Farms and Food as part of the Winter Study Program at his alma mater, Williams College.